Solidago juliae Nesom is native to the Hill Country and Trans-Pecos region of Texas and rarely in northern Mexico and possibly southern Arizona. 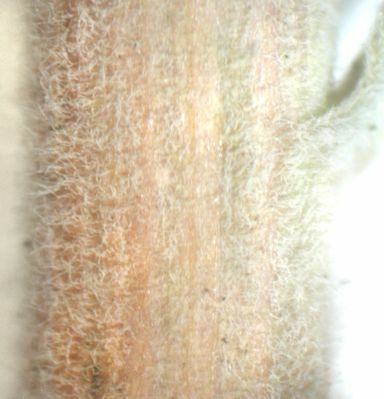 A specimen from Sonora may be an atypical S. juliae individual, while several specimens from Arizona are similar but have less densely hairy leaves and may belong in a different species. Solidago juliae is the most densely short-hairy of the Tortifoliae group of species in subsect. Triplinerviae; the narrow leaves are similar in shape to those of S. altiplanities. Solidago juliae can be similar to some plants of S. chilensis of South America and S. pringlei of Mexico. 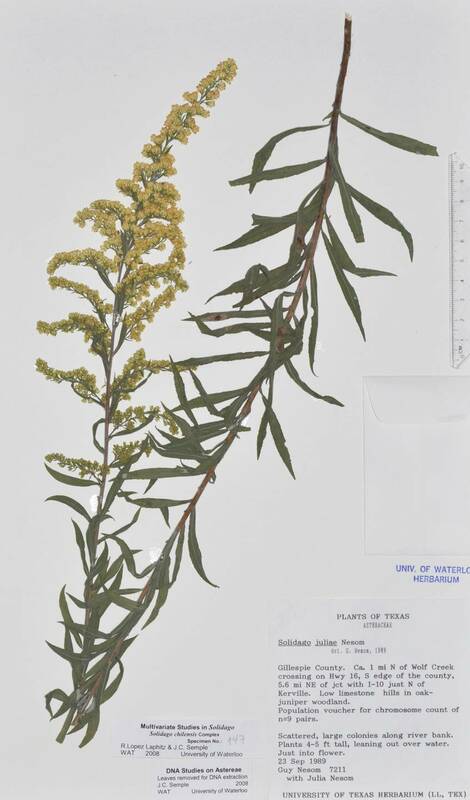 Solidago juliae has been included in several multivariate studies involving different species of Solidago. Semple et al. (2015) reported strong statisical support for recognizing S. altiplanities, S. altissima, S. juliae, and S. canadensis in a multivariate study. Lopez Laphitz and Semple (2015) reported strong statistical support for recognizing S. juliae in a multivariate study of S. chilensis, S. juliae, S. leavenworthii, S. microglossa, and S. tortifolia. Semple and Lopez Laphitz (2016) compared S. altiplanities, S. chilensis, S. gypsophila, S. juliae, S. leavenworthii, S. microglossa, S. pringlei, and S. tortifolia in a study focused on S. gypsophila and S. pringlei. Semple et al. (2018) included S. juliae in a study of S. durangensis. Solidago juliae was also include in multivariate study of S. altissima, S. juliae, S. pringlei, and S. veracruzensis (Semple 2018) in which S. juliae was most morphologically similar to S. pringlei and S. veracruzensis based on the characters selected to separate the species. Solidago canadensis var. canescens A. Gray is a synonym. The species is diploid 2n=18 and sometimes tetraploid 2n=36. Semple, J.C., H. Rahman, H., S. Sbovski, M.K. Sorour, K. Kornobis, R. Lopez Laphitz, and L. Tong. 2015. A multivariate morphometric study of the Solidago altissima complex and S. canadensis (Asteraceae: Astereae). Phytoneuron 2015-10. 1–31. Lopez Laphitz, R. and J.C. Semple. 2015. A multivariate morphometric analysis of the Solidago chilensis complex in South America and related taxa in North America (Asteraceae: Astereae). Ann. Mo. Bot. Garden 100(4): 423-441. Semple, J.C. and R. Lopez Laphitz. 2016. 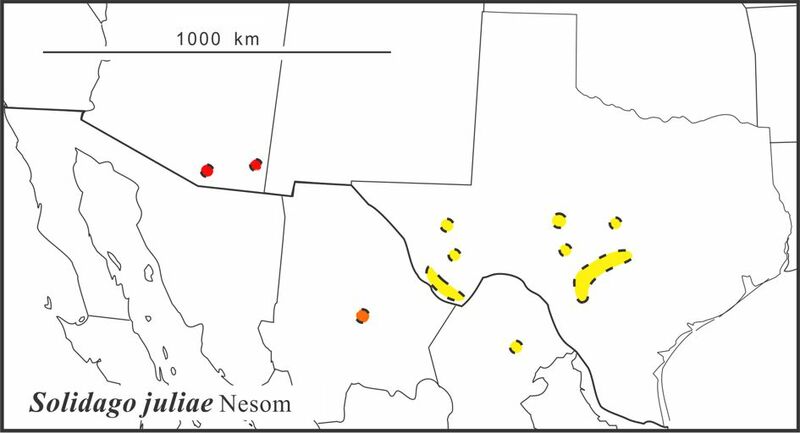 On Solidago gypsophila and S. pringlei (Asteraceae: Astereae), rare and not so rare Mexican endemics: a multivariate study of the Tortifoliae group of S. subsect. Triplinerviae. Phytoneuron 2016-29. 1-20. Semple, J.C., R. Lopez Laphitz, H. Rahman, and Yunfei Ma. 2016. On Solidago durangensis (Asteraceae: Astereae): a multivariate study with specimens of S. subsect. Junceae, S. subsect. Maritimae, and S. subsect. Triplinerviae. Phytoneuron 2016-49: 1–19. Semple, J.C. 2018. 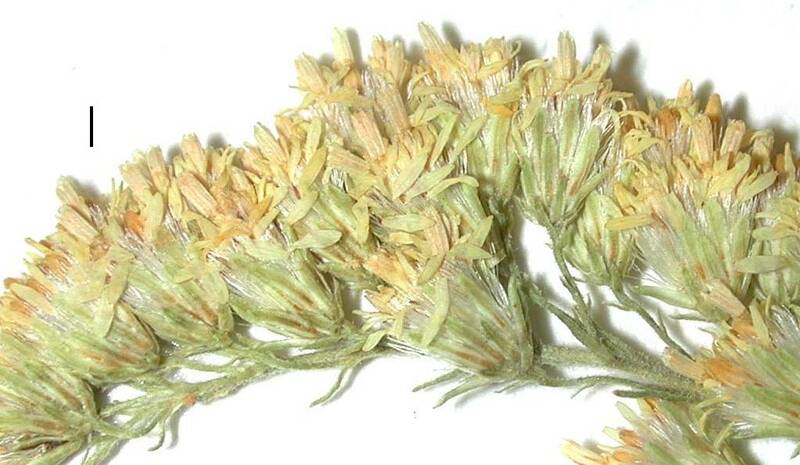 Solidago veracruzensis, a new species of goldenrod in S. subsect. Triplinerviae (Asteraceae: Astereae) from Mexico. Phytoneuron 2018-52: 1–18.